The new wall in Trench T, complete with large orthostat visible behind. The story of Trench T becomes more and more interesting as each day passes. Yesterday we told you of the discovery of what appeared to be a roof tile/slab, and potential working area for such artefacts, next to one of the excavated pits. Today, at the bottom of the trench, beyond the large, broken orthostat, something even more remarkable emerged. It is the remnants of a well-made wall, robbed of most of its stone, but probably representing the outer face of the wall. It lines up nicely with the orthostat, to which it is perpendicular, and which may well turn out to be the remains of orthostatic division within the structure. 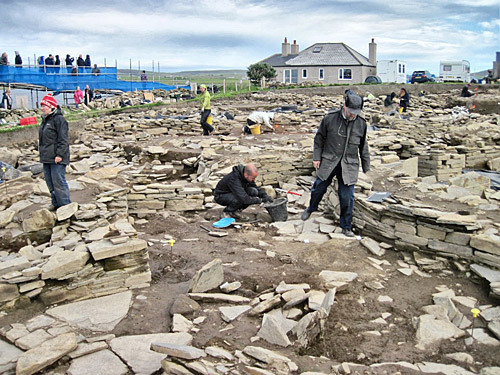 This technique of partially recessing orthostats into walls is similar to a building in Trench J and to Structure Twenty, which lies under Structure Ten – and also intriguingly seen in the stalled style of chambered tombs, such as the Blackhammer and Midhowe cairns, in Rousay. As the orthostat is large, this may mean that the Trench T team have come across the remains of a big building, totally unexpected in that location but perfectly in tune with the surprises which the Ness throws at us regularly. The temptation is, of course, to wall chase and to find out immediately where the structure goes (if it goes anywhere). But that is not the archaeological way. Although the team have been steadily working their way through the 20 pits already discovered in that locality, there is still a good deal of later material to be dealt with before the question of the potential structure can be resolved. We will keep you fully informed. New wall lines visible behind Alice, at the south end of Structure Eight — a possible buttress? More surprises have appeared in Structure Eight, where work has continued removing the last of the rubble and midden from the south end to search for the elusive south entrance. A new wall line has appeared suddenly and it is now possible that we misinterpreted one of the earlier wall lines as a possible outer revetment. It now seems likely that the inner wall surface of Structure Eight has slumped over and that the new wall line may indicate a corner buttress, inserted into the building to try and counter slumping, and that this may also incorporate an original pier. It is fiendishly complex and it is possible that so much material has been removed to allow the construction of Structure Ten that we may never find the south entrance to Structure Eight. Andrea and Ray reveal evidence that Structure One, in its primary form, was roofed with stone tiles. And further surprises from Structure One. At the north end of the structure, and outside the Phase Two curving, inserted wall, Ray and Andrea have come across several roof slabs. We can almost hear Ray groaning from here, as he was one of the original convicts compelled to spend many miserable hours measuring, documenting and generally coddling the innumerable roof slabs of Structure Eight. Our hearts bleed for him. We were delighted again to be visited by Lord Renfrew, his wife, Jane, and family. To the abject terror of our archaeologist tour guide, Lord Renfrew went along on a tour. It is one thing to listen to Lord Renfrew speaking about the Neolithic from the unique depths of his knowledge, and quite another to tell him about things he has known since the tour guide was in short pants. Scary! Lastly, the Beepers, our much-loved survey team of Mark and Beth. The howling wind which has terrorised diggers all day caused a length of material to be whipped upwards, depositing distinctly unclean water over them. We will monitor them for signs of Bubonic Plague, in which case they will have to find a trench all on their own. My name is Kenneth McElroy, and as I write this, my ankle is propped up on the table, having suffered a sprained ankle. I’d better explain — before the health and safety folk have a heart attack — that the injury is not Ness of Brodgar-related. If you look at the Meet the Team section of the site, you’ll see that I’ve listed “tripping over daisies on the football field” as one of my favourite activities, so, there you go! 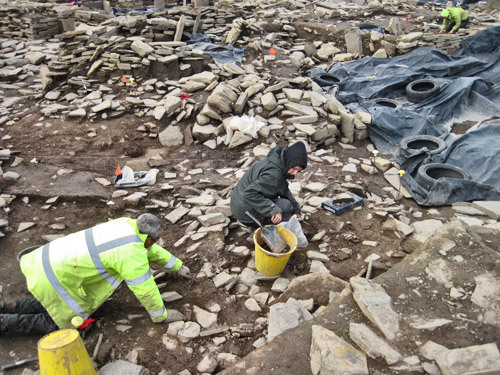 Despite this crock curtailing my archaeological pursuits (for at least today), I remain positive and now have the chance to sit down and reflect on my first week taking part in the Ness of Brodgar excavations. Perhaps it would be useful to introduce myself first. Chris Gee shows today’s Excavation Club the art of Neolithic stone decoration and pigment preparation. 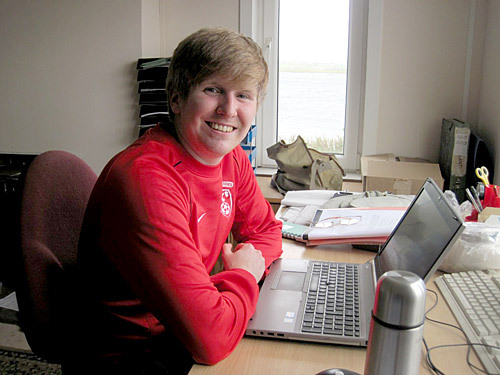 I am one of 16 Museums Galleries Scotland “Heritage Horizons” trainees based across museums Scotland, and one of two working at Orkney Museums. The Heritage Horizons programme gives people the opportunity to work in a museum, and learn all about the museums industry — this year is a bit special, as it’s the first year they have taken on those without university backgrounds, i.e. non-graduates. Originally, I come from Thurso, in Caithness, so Orkney was the obvious choice for me. 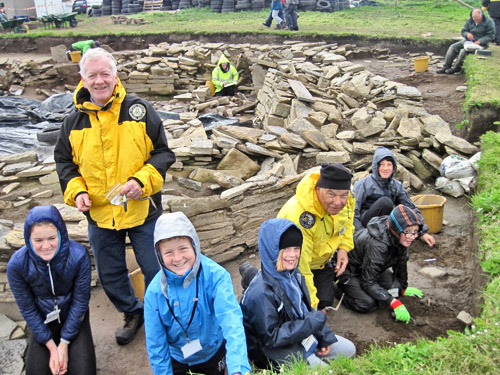 I have visited Orkney several times and have long been fascinated by its amazing variety of historical and archaeological sites, and so the opportunity to work at the Ness of Brodgar, one of Europe’s most important sites, was a very pleasant surprise indeed. 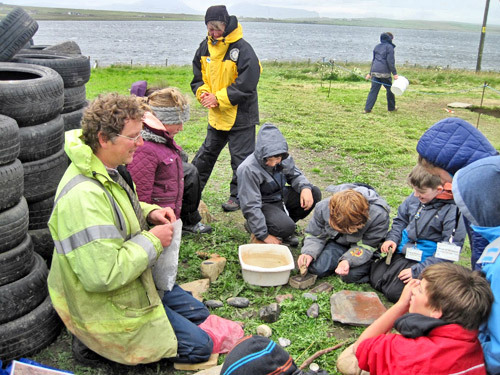 I was a little worried, given my lack of archaeological expertise (chances to take part in archaeological events in Caithness are few and far between) that my services would be limited at the Ness. However, I found out in the first few days, you don’t need much of an archaeology background to shift hundreds of tyres and sandbags, just bags of energy, work ethic and big muscles! Actually, mind you, I haven’t got any of those either . . . 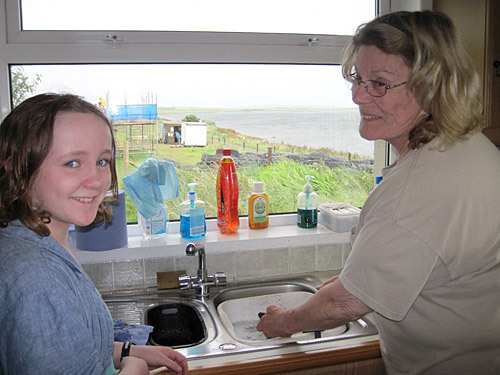 The ‘Rock Lady’ Martha and her stone-washing assistant, Beth. The first few days were hard work, but when you have such a hard-working, friendly and enthusiastic team alongside you, it makes the work much more satisfying. Even when you are a positioned beside a 6 foot 5 Dutchman, who has the propensity for laughing manically as he slams tyres into your body. Eventually, we managed to remove all the protection, and when the site was fully revealed, it was an amazing sight. 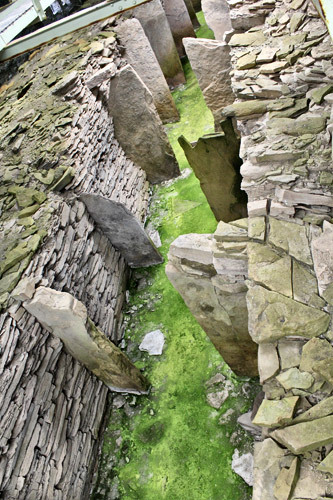 I’d never seen anything like it; a labyrinth of ancient stone appearing from beneath the ground. It’s amazing to think that something as huge and complex as this has lain under the ground undiscovered for so long. I’m especially impressed with the near-pristine walls in Structure One – they look like they have been built yesterday. It was during the next few days I was able to help excavate around the site. There is something so exciting about excavation and the thought of finding objects: I believe it’s something we all derive pleasure from; who can deny the pleasures of excavating the back of the couch and discovering the remote control? Despite the howling wind, there were some happy faces at today’s Excavation Club. And so, when “cleaning up” around the edges of a Structure, a tiny object popped out. It was a small, smooth and slightly reddish ball. I showed it to a few archaeologists, and it transpired that I’d not only found a ball of fired clay (its purpose not understood yet) but had made the first find of 2015 too! Although my place in the history books and the front page of The Orcadian had been assured, I made another discovery on the second day of excavation — a piece of Grooved Ware pottery. It was a piece of the “lip”, and had a beautiful “rick-rack” design too, so I was especially pleased with this. It’s difficult to describe to people why I like history and archaeology so much, but when you find, touch and hold objects like these, it’s really quite humbling. I think that asking questions and wanting to know more is a pretty natural thing to do – so I think it’s good to reflect on the past and try to learn more about ourselves. Well, I’ve done enough reflecting now, and I’ve learned that I can certainly ramble on, so will wrap it up now. P.S. As I’m from Caithness, I think the weather has been simply Mediterranean throughout!